And so they do, sometimes crazier than others. The one shown above is one of my weirdest so far, and I thoroughly enjoyed it. When cooking dolmas recently I felt the need for a Cook’s Treat, and there were some nice grape leaves left over that I had no other immediate use for. I heated my little 6″ skillet over medium heat and, when hot, brushed a grape leaf generously with good olive oil on both sides and put it flat in the hot pan, pressing down a bit with a spatula to make sure the leaf cooked evenly. Flip and repeat. Put on a paper towel and sprinkle with salt. 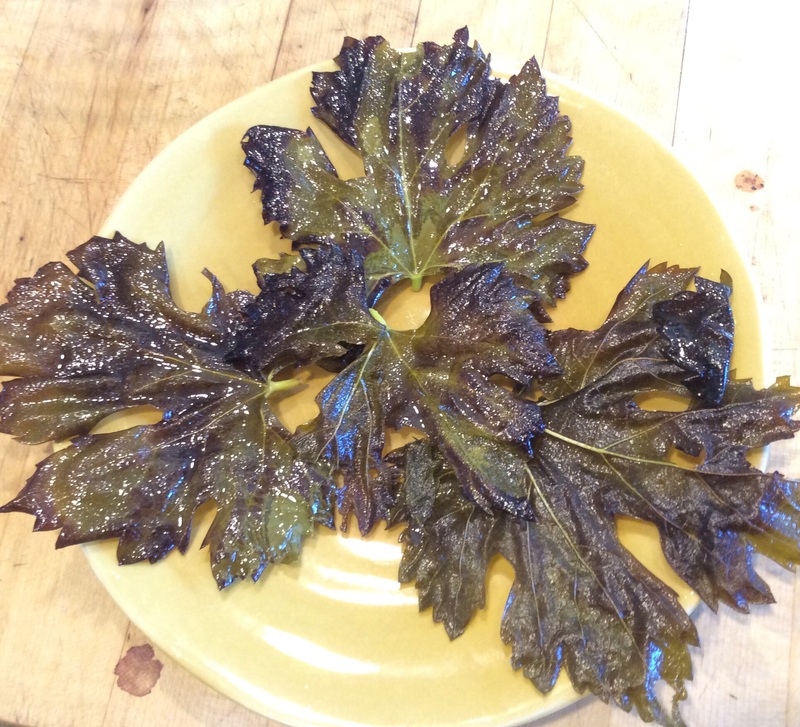 If the heat is right, the leaf will cook in about 20 seconds or less per side, will be darkly browned in spots but not blackened anywhere, and will be crisp as an ultra-thin potato chip, with a light, delicate crunch and a hint of lemony-sorrel flavor. Have at least 3-4 extra leaves to get the heat right, but once the heat is adjusted, you can make and plate a serving in a couple of minutes. It is easy to do for two but would be fiddly for four. I like to oil all the leaves at once and then have nothing but the frying to concenrate on. Why do it? Well, it’s different and it tastes good, at least if you like grape leaves and olive oil. The texture and flavor are not quite like anything else, and pleasant novel experiences delight me even when they’re minor. I can imagine a more substantial meze made by adding delicately spiced little fried meatballs to the plate. Little cubes of marinated feta would be another option. Incidentally, the grape leaves that you use must be suitable for cooking. 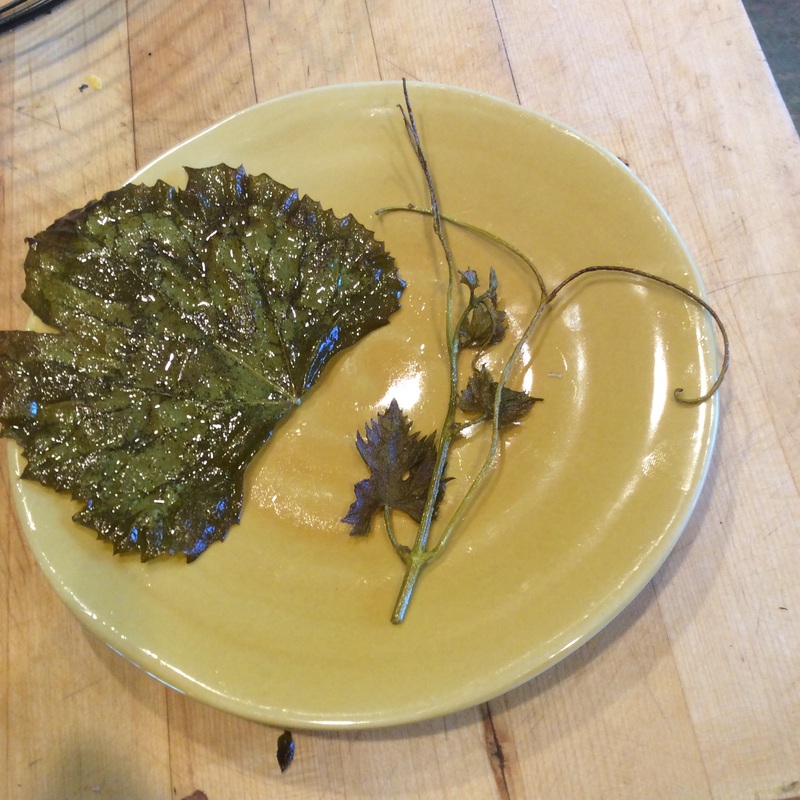 Please see my notes from my dolmas post on choosing grape leaves for cooking. A grape leaf that has papery unchewable fibers when raw will chew like a fried paper bag when fried. I also tried frying a pruned tendril. The stemmy part was tough chewing. It looked charming in a rather baroque way, but probably should be considered a garnish rather than part of the Crazy Salad. That said, I ate mine.